Sweat Bee, common name for any of a large family of bees, many of which are attracted to the salts in human perspiration. Most sweat bees are small to medium-sized, 3 to 10 mm (0.12 to 0.40 in) long. They are generally black or metallic colored, and some are brilliant green or brassy yellow. Sweat bees are among the most common bees wherever bees are found, except in Australia, where they are relatively uncommon. There are about 1000 species in the United States, Canada, and Central America. 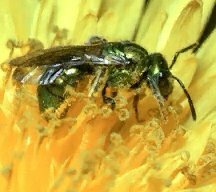 Sweat bees are particularly numerous in North America. Although their small size makes them relatively inconspicuous, hundreds may swarm over flowers in gardens or meadows. The different species are often difficult to distinguish. Most sweat bees visit a variety of flowers. They sting only if handled. The life cycles of sweat bees vary tremendously among species. Most species nest in the ground, but some nest in wood. Nests usually consist of a single main tunnel having one or more clumped cells arising from lateral branches. In some species, the bees constantly guard the nest entrances. A wide range of social development is displayed in the family. Some species, such as the common eastern sweat bee, have been intensively studied. Many insights into the evolution of social behavior among insects have been learned from sweat bees. Many species are solitary-that is, the female builds and occupies its nest alone. This is considered the basic, most primitive nesting behavior. In some sweat bee species, females nest communally, sharing a common nest entrance but constructing cells individually. Many species, including the common eastern sweat bee, show varying levels of sociality, passing through a continuum of stages in social development. In these species, there may be several egg-laying "queens" with the other nest mates functioning as workers. Sometimes generations of these bees overlap and live together and there may be a division of labor among nest mates. However, unlike many social bees, such as honey bees, there is little communication between adults. The alkali bee is a somewhat unusual ground-nesting sweat bee native to arid regions of the western United States. It is black with pearly bands on the abdomen. This solitary, gregarious bee nests in alkali soils where water leaches from below to the surface, leaving a salty crust. The bee forages on a wide variety of flowers but is particularly attracted to alfalfa and pollinates it very efficiently. Commercial alfalfa seed growers use the alkali bee for pollination in parts of the West. They maintain or construct special alkali bee beds to cultivate thousands of bees. In some parasitic species of sweat bees, females invade the nests of other bees and lay their eggs in the food stored by the host bee. The sweat bee larva kills the host larva and consumes the food. Hosts are usually other species of sweat bees. Scientific classification: Sweat bees belong to the family Halictidae, order Hymenoptera. The common eastern sweat bee is Dialictus zephrum. The alkali bee is Nomia melanderi. Parasitic sweat bees are found in the genus Sphecodes.